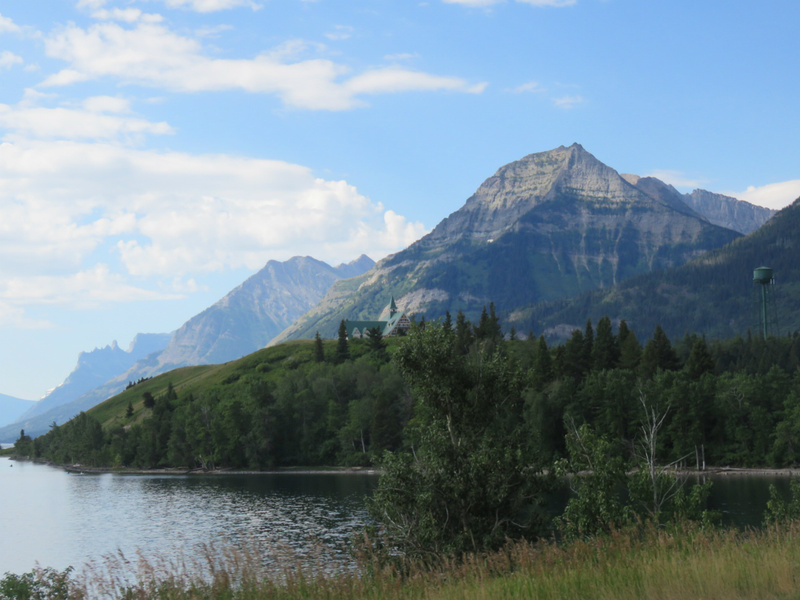 Not far to go today, however we decided to visit Waterton Park in Canada, which is actually attached to the Glacier Park in Montana, USA but just over the border. Very pretty it was too, alothough not as spectacular as Glacier Park. Last night we had visited the ATM in town and taken out some Canadian Dollars for our stay, we’re guessing probably a month or so, broken up by our visit to Alaska. There’s a whole new cash system for us to learn, including something called ‘loonies and toonies’! There’s also a return to buying fuel in litres like at home, and a switch over to kilometres from miles. There are lots of other subtle differences here that we’ve spotted during our first day. The Canadians seem a little more reserved than Americans, much more like people at home, but very nice and friendly once we get chatting. Most products and signs are written in both English and French, people seem to drive faster, and there seems more of a mix of people here. A day off for us tomorrow, so we’ll have a look around Fernie, and a rest. 29.07.16, Columbia Falls, Montana to Pincher Creek, Alberta, Canada. We have made so many new friends already on this trip, the people that we have met along the way have helped to shape our experiences, both by what they say and the places they suggest to visit. The last couple of nights we spent in a B&B, very near to the West Glacier Park entrance. This is the first B&B we have used, and it was a truly pleasant experience. Not least because we spent time sitting with other people for breakfast, and in the ‘Den’ of the B&B, slurping on our two glasses of free beer/wine each night! We have now been invited to visit or stay with people we have met more times than we can remember, and our stash of cards from people is growing. There are many different types of people that we form a quick bond with, young, old, on their own, in couples- this is still by far the friendliest place we have ever been. 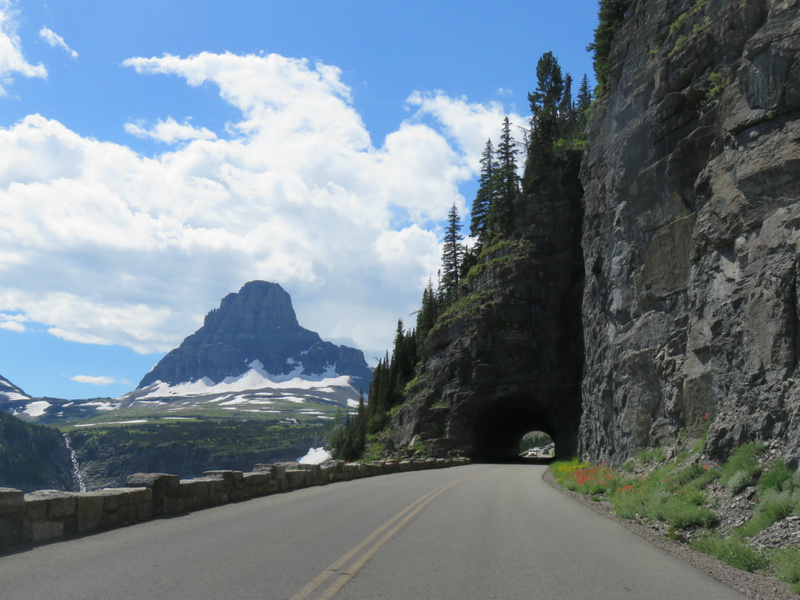 We visited the Glacier Park again today, this time riding the Going To The Sun road from West to East, still just as spectacular, but noticing waterfalls, and plants we hadn’t spotted yesterday. Once out the other side, and at a drink stop at St Mary’s we met a couple of young Argentinians, Belen and Tito, who have both made separate trips from Argentina to Alaska on small motorbikes, 100cc and 125cc respectively. Belen, the girl has actually ridden over 36,000 miles on her little bike in 4 years. Tito had ridden 52,000 miles on his. Absolutely awe-inspiring people, full of enthusiasm and life. What a pleasure. After this, and chatting to some more people there, Mona, Tim, Steve and Laury, we headed off for the Canadian Border. The other guys were on holiday on their Harley’s, and had wanted to cross over the border and back again, but suddenly realised they needed helmets for Canada, and they didn’t have one between them. Still, they rode up there, and we met them again, as we waited in the queue. The crossing into Canada was painless, a show of our passports (new stamps, hurray), a question over the registration number plate, any food, any guns, and how long we were staying and we were in. Not like one of the guys ahead of us, he was travelling alone in a camper van, from Colorado, and had brought in firewood, not the done thing, so the officers were searching his entire vehicle. A stop tonight in Pincher Creek, perhaps not the most salubrious of towns or establishments we have chosen, but things can only get better tomorrow. After a hearty breakfast of ham, pancakes and maple syrup, we set off for the Glacier National Park this morning. We were staying about 15 miles from the West Entrance, but had decided to head for the East side, and ride through the park, East to West, to end up where we were staying. On a very good recommendation, when we visited Badlands National Park we had purchased an Annual Pass to the State Parks for $80. We were able to use this for entrance today, and this was the 4th time we have used it to enter a State National Park so far, so it has saved us quite a lot of money on entrance fees. We rode all the way around and above the park, before making our first entrance at Two Medicine, a dead end, offering scenic cruises on the most picturesque lake, Lake Two Medicine. This lay right on the Continental Divide again. This is where the waters either side of this line flow in different directions, either West to the Pacific, or East to the Atlantic Oceans. Whilst at Two Medicine, we met an Australian couple, Lesley and Joel who have been in the USA for three months, and crossed the country in the Ford Yukon XL, which they had bought in Vancouver, Canada and were using as their home, their everything. They had a lot of useful tips, about places we haven’t yet visited, and it was very pleasurable to pass an hour or so discussing the differences and similarities between Aussies and Brits, and how we have been enjoying the USA. After Two Medicine we rode up Highway 49, then Highway 89, before entering the park at the East Entrance. The Australian couple had been warned ‘it’s a zoo in there’, so we wondered just how busy it would be. However, we turned in at St. Mary’s Lake, and immediately started off on the Going to the Sun Road, which runs through Rising Sun onto Logan Pass, for 18 miles, passing through such places as Sunrift Gorge, Triple Arches and Weeping Wall. 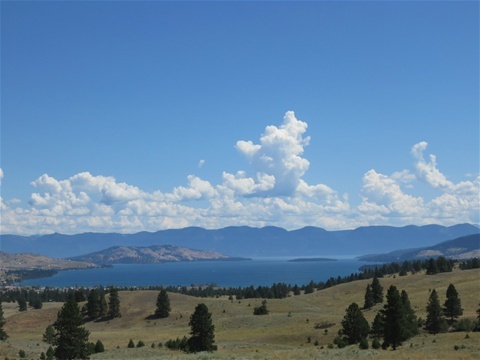 The road is surrounded by mountains, and was built especially for viewing these glacial lakes and mountains in the late 1920’s, and opened in 1932. That year they had 7,500 visitors from April to October. Nowadays they are more likely to receive 1,500,000 during the same season. Our eyes were taken by the blue blue glacial lakes, contrasting with the snow capped peaks, putting us in mind once again of those wonderful endless Fjords in Norway. We didn’t take any of the trails away from the road, which are for hiking, this time, especially as we had been warned that you must take bear spray, but within the park, we did stop to look at Goat Lick, where mountain goats cling to the rocky sides of a mountain, and lick the rock for vital minerals (not today though). In fact, the only animal we saw today was a mountain goat digging himself into a nice dirt pit way up high over the road. Tomorrow we shall return to do the road in reverse, heading this time towards Sun Point and Rising Sun on the road, before we head onto our next stop. Paul went off this morning to collect the bike from Big Sky motorsports, and after a final packing we were on our way. Our route today is taking us towards the Glacier Park in Northern Montana. The closer we have come to this park; the more people tell us how wonderful it is. We were stopped and chatted to by a good 5 different people today, and they all want to discuss the Glacier Park, Bears and the AlCan highway (Alaska/Canada highway). People here really do love to share both their experiences and their absolute devotion to the State of Montana. We cannot blame them; it has not disappointed yet. One man shared the information with us today that Montana is the same size as Germany, and that there are 85,000,000 people in Germany, and only 1,000,000 in Montana, no wonder it’s blissful. Today we rode through some much drier landscape, up high and covered with gorse and wildflowers, before dropping down from above, to ride alongside the Flathead River. Again, there are many Native American Indian Reservations in this area. As we dropped into the town of Lakeside, I imagined myself momentarily to be at Lake Como in Italy. Here though, there are a lot of German style buildings. At brunch this morning, we chose a wonderful little roadside diner, full of the obligatory locals with their Stetsons and Cowboy Boots, passing the time of day. Breakfast was as good as anywhere we’ve been, but the crowning glory for Paul was his Huckleberry Milkshake, which you could stand your spoon up in. Huckleberries taste really good, and are indigenous to Montana. Tonight we are at Columbia Falls, and as we popped along to the supermarket, I spotted the tops of some old cars in a recreation area at the side of the Highway. When we stopped on our return, it turned out to be some kind of show, and we had a lot of fun looking round all these old cars. 26.07.16. Seeley Lake, Montana to Missoula, Montana. A later start and not far to ride today, as we’ve booked in to have the bike serviced at Big Sky Motorsports, in Missoula, Montana. This is a city with a University and has about 50,000 population. That’s huge for around here. Another beautiful ride, twisting along through spectacular scenery, before arriving in keenness at about 12.30pm for our 2pm appointment. No matter, the guys working there (and there were so many! ), were friendly and offered us a place to stash our bike gear, whilst we set off in search of a few essentials. Before we left there was time to look for chain lube, and another Rotopax fuel canister, which we are able to lock onto the side of the bike. 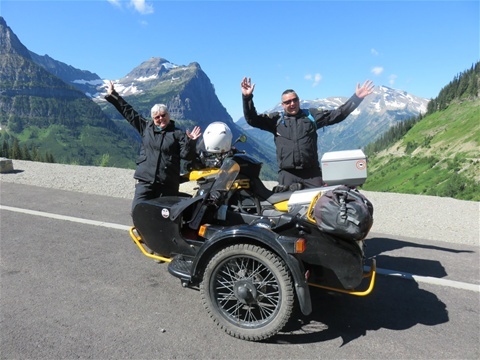 Prior to having the sidecar put onto Paul’s bike, he would have achieved approximately 225 miles to a tank of fuel, but with the added weight, this has decreased to 160 miles to a tank. We had already added one extra fuel canister, which added an extra 80 miles before refuelling, so another one will now give us an extra 160 miles. This will be a real help to us when we reach Alaska, as the distances between fuel stops will be greater. There was also time for a good chat with a couple of members of staff (Brexit and Trump being the main topics), and for Paul to find someone to share the story of our adventure with, Brad, who was dropping off a friend, but was pleased to chat with Paul. Once we set off from the shop, our main objective was to find a haircut, each! Not 100 paces from the shop was a hairdresser, but it was closed for lunch. Never mind, another 100 paces away there was another one, Becky’s Superior Cuts, I walked in whilst Paul searched out drinks, and she said take a seat, I’ll be with you in 5. By the time Paul returned with the drinks, Becky had finished my hair and it was Paul’s turn under the scissors. 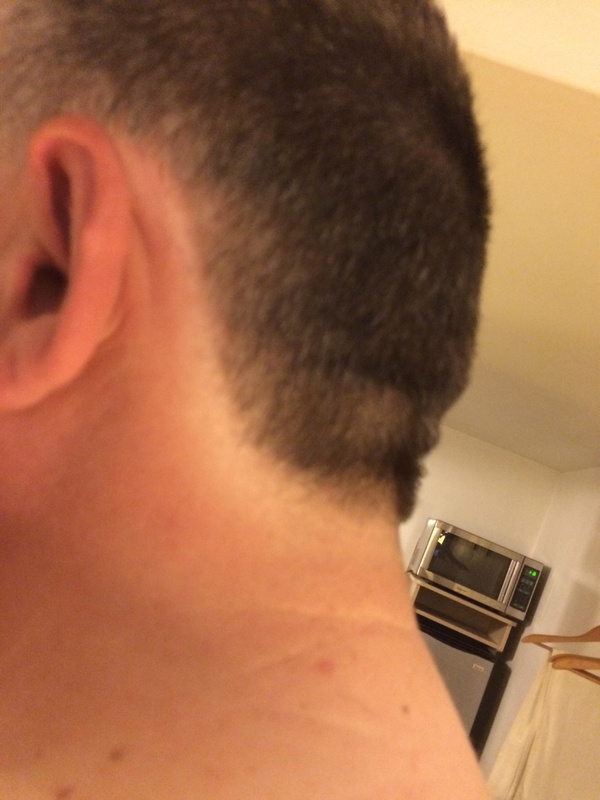 For those of you that remember the horror of the Austrian ‘buzz cut’ by the alcoholic Austrian lady, you’ll be pleased to know this was a little more civilized, only revealing to us a nice white line around Paul’s hairline where his hair had previously been. Tonight we are in Brook Street Motor Inn, as recommended by Big Sky, and with a discount, can’t be wrong! We’ve eaten our dinner in Denny’s American Diner, and will collect old bikey again in the morning.